If I had a nickel for every time someone stopped me at the mall or in the school halls to ask me about my new iPhone case by Bandolier, I would have enough money to buy a second one. And I wouldn't even hesitate. This brilliant solution to my smartphone woes has changed how I go about my daily routines. I first learned about this chic accessory at the grand opening of the new iStore in the Scarborough Town Centre last fall. It was love at first sight! Since my husband bought me a new iPhone 6 for Christmas, it was the perfect excuse to head back to the iStore. I nabbed a leather Bandolier with gold mini studs, similar to the latest model seen above. And as a bonus, it was on sale! What makes this accessory incredibly handy are the two precision cut slots in the back that hold a credit card and a driver's license so I can leave my purse at home. Or, if you have a credit card loaded onto your Ugo Wallet app like I do, you can use the second slot to store cash. The major advantage of having my phone attached to a strap is that I will never lose it or drop it. And the fact that the strap clips onto the bottom of the phone case makes it easy to lift the phone to your ear since you don't have to turn it upside down. You will want to make sure you have a screen protector but ideally, I would love to see a folio version of the Bandolier in the future. 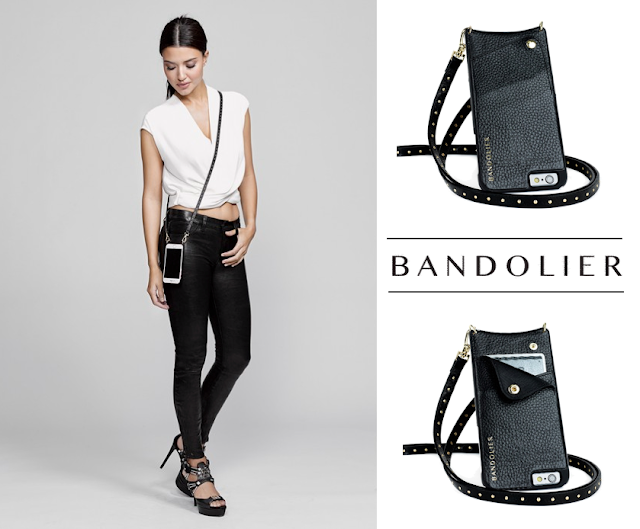 Bandolier is available for iPhone 5/5S, 6/6S and 6 Plus/6Plus S as well as Galaxy S5. Prices vary from $60 to $150. Pretty cool accessory for phones, quite expensive but stylish! It certainly isn't cheap but, given that it can replace my current handbag, it's actually quite liberating being able to walk around the mall with just my iPhone and Bandolier. My oldest needs one of these! What a beautiful and useful product! My daughter would love one of these! And they have so many fun and chic styles to choose from. This is the prettiest phone case I've ever seen! I would LOVE it! I'm still getting so many compliments! LOL It's never too soon, I say! that looks so awesome. I have something like that and I loved carried it around....until I traded in my iphone. This looks a lot nicer than having your phone sticking out of the tops of your pants or in your bra, my girls need something like this, I love it!! This is exactly why I bought it! That, and I love the look of it, too! Wow! What an awesome good idea and it looks great.I love the convenience of it too. I also love that I can easily remove the strap if I ever need to store my phone in a purse. I just got an iPhone6 and am definitely wanting a Bandolier as it would be so freeing to not haul around my purse when I am shopping. You should definitely look into it. Hopefully you can find a good deal since they cost a lot more than a regular case. What a great idea! I often get stuck on where to stash my phone! I know! For me, it's been a great way to prevent me from dropping my phone, which has been known to happen more frequently than I care to admit. Bailey Dexter Wow, what a great case/purse! So easy to get at the phone but not hanging out of a purse! This is really smart looking, and a nice way to keep it safe. I'm not really a purse person. I'm 36 and I'm still sporting my backpack style purse from my early 20's. But I really like this idea. It's slim not bulky and would really hold the minimum I carry with me. For me this would be ideal. With my phone connected to a strap I'm also less likely to leave it behind somewhere which I'm know to do. Thanks for sharing. Never new this was an option. Wow, what a stylish and functional case, but a little pricey. Has it held up well so far? This looks so stylish! I wish my phone fit into one of these!